This is another one of those things that's been long since rumored to be coming to Disney Hollywood Studios in Orlando. 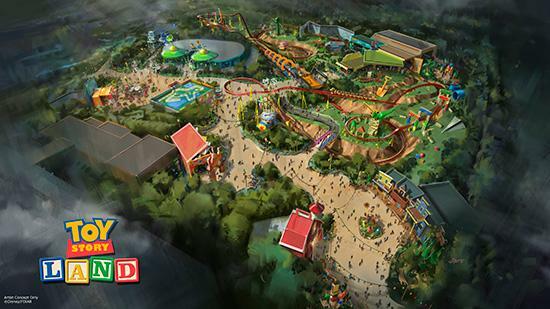 Well, today, those rumors can be put to rest as during the Parks & Resorts Panel at the annual D23 Expo, Disney finally unveiled their plans for Toy Story Land. This, along with the earlier announcement of the all new Star Wars Land also coming to Hollywood Studios means that a lot of the park will be changing over the next few years. As you can, from the concept art, there's a ton of things going on in there. Some rides are going to get improved, such as a third track being added to Toy Story Mania to improve capacity and also a few new rides and experiences as well. One of those being, The Little Green Men Flying Saucers. It's a spinner ride, but with a little extra twist as "The Claw" will decide who stays and who goes. Sounds pretty interesting there, but without seeing anything specific, can't be sure what that means. The larger, and dominating feature of the concept art is what will be the Slinky Dog Coaster. Yep, that's right, you get to take a ride on on Slink. 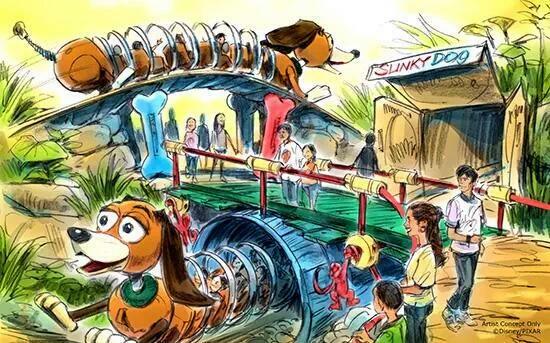 Not really sure just what exactly they have planned for this one but it appears that riders will be inside Slinky Dog as they twist and turn through various sections of the park. Again, we're going to have to wait for more details on this one, but adding a slightly more kid friendly coaster to Hollywood Studios isn't entirely a bad idea at first glance. So far, that's all that was told about new Toy Story Land expansion project at Disney Hollywood Studios, but you can be sure there's going to be a ton of info coming as we get closer to an opening date. Speaking of that, no clue when that is either. So, stay tuned as more details come out from Disney at this year's D23 Expo and beyond!